Works great! Makes swaddling a lot easier and baby does not break free. I didn't expect to like this so much! My son would have gone nuts with his arms pinned (Or maybe not, will never know! ); and I felt guilty about doing so with my daughter. But it works. Helps calm her at night and for naps. It's a bit cumbersome to unwrap her for night changes, but once you get the hang of it it's alright. Is this a magical sleep pill? No, but it certainly helps! i tried the ergo cocoon and the Woombie with my daughter, but she didn't like them as well as the Miracle Blanket. Going to buy a backup and recommend to others! Make sure the swaddle is below the shoulders, otherwise it may brush the baby's cheeks and activate the rooting instinct. I have learned this is key! Loved using this swaddle with my baby. Literally used it for all naps and every night for bedtime. He never was able to break out of this swaddle and slept so good. It was perfect to help with transitioning out of the swaddle too. Highly recommmend as a baby product. I bought this wrap for my newborn and we are using it every night. 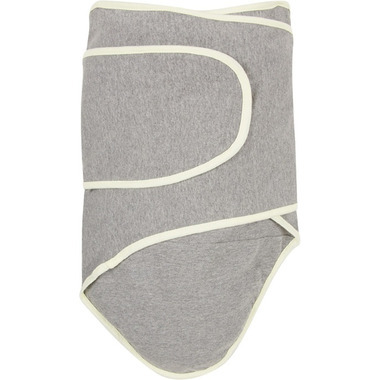 It's easy to use and the perfect fabric for keeping baby warm but not overheating. I bought this for the 13 week old son because he still needed to be swaddled to sleep, but repeatedly broke out of my muslin swaddle. He only managed to break out of this one once and 3 weeks later, I'm really glad to have it! It's easy to do and smaller babies shouldn't be able to break out. And if your baby gets too long, you can just keep the legs out of the pocket. I bought this in the middle of the night one night after my 6wk old had broke out of his swaddle again. It is GENIUS. It keeps his arms tight and the extra length of fabric doesn't let it come undone and with no velcro to wake him up. I am devastated that now at 11wks he is getting too long for it and I will have to find something similar to use. My only very small note is if you have to do middle of the night diaper changes, you do have to undo the outside flap which can sometimes wake him up a bit more. Good swaddle and easy to use, my only complaint is after only 10 uses two small holes have appeared by the foot pouch, on both sides - for the price I wouldn't have expected such cheap material.